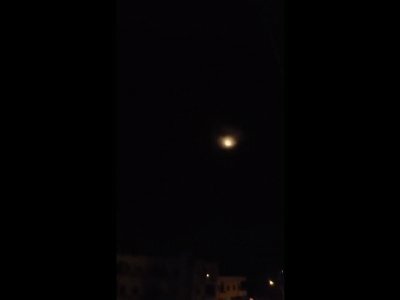 The timing of the airstrikes in central Homs province, hours after President Donald Trump said there would be “a big price to pay” for the chemical weapons attack, raised questions about whether Israel was acting alone or as a proxy for the United States. The strike on the air base reportedly killed 14 people, including four Iranians. Russia’s U.N. ambassador, Vassily Nebenzia, urged inspectors from the watchdog agency to fly to Syria’s capital Tuesday and visit the site in a nearby rebel-held town. He denied any attack occurred, telling the Security Council that experts from Russia’s military radiological, biological and chemical unit went to the site and found no chemical substances on the ground, no dead, and no poisoned people in hospitals. Trump on Monday condemned the “heinous attack” in Syria and said later at a Cabinet meeting that he would “forcefully” respond. “Nothing is off the table,” Trump warned. Nebenzia called a U.S. military option “very, very dangerous,” not only for Syria itself but for the world. British Prime Minister Theresa May said Assad’s government and its backers, including Russia, “must be held to account” if it is found to have been responsible for the suspected poison gas attack. “Yes, this is about the actions, the brutal actions by Assad and his regime. But it also is about the backers of the regime, and of course Russia is one of those backers. ... And they need to look very carefully at the position they have taken,” she said. The Security Council held an emergency meeting to discuss the chemical attack and the council president said experts were working on a resolution on the continuing use of chemical weapons in Syria, but sharp differences remain between Russia and the U.S. and its allies. The airstrike was the second this year on the Syrian air base, known as T4, where Iranian fighters are believed to be stationed. Israel hit the base in February, after it said an Iranian drone that violated Israeli airspace took off from it. Russia’s Defense Ministry said two Israeli aircraft targeted the base Monday, firing eight missiles. It said Syria shot down five of them while the other three landed in the western part of the base. Syrian state TV quoted an unnamed military official as saying that Israeli F-15 warplanes fired several missiles at T4. It gave no further details. Israel’s Foreign Ministry had no comment when asked about reports of the airstrikes. Amos Yadlin, a former Israeli fighter pilot and ex-head of Israeli military intelligence, stopped short of saying Israel was responsible for the airstrike. But he suggested that the chemical attack had crossed a red line and prompted Israel to take action to send a message to Syria and arch-enemy Iran. Since 2012, Israel has struck inside Syria more than 100 times, mostly targeting suspected weapons convoys destined for the Lebanese militant group Hezbollah, which has been fighting alongside Syrian government forces. The base, which was used as a launching pad for attacks against Islamic State militants who were at one point stationed nearby, is near the Shayrat air base, which was targeted by U.S. missiles last year in response to a chemical weapons attack. Syria’s state news agency SANA initially said the attack on the T4 air base was likely “an American aggression,” but the Pentagon denied involvement, and the agency then dropped the accusation, blaming Israel instead. SANA said the missile attack resulted in a number of casualties, but provided no specific figures. The Britain-based Syrian Observatory for Human Rights, which monitors the war through a network of activists on the ground, said 14 died, including Iranians and three Syrian officers. The U.S. launched several dozen Tomahawk cruise missiles at a Syrian air base after a chemical attack in the northern town of Khan Sheikhoun killed dozens of people almost exactly a year ago. The Syrian government has denied the chemical weapons allegations, calling them fabrications. The Russian military said its officers visited the hospital in Douma and talked to the staff, and said they did not confirm reports of the assault. First responders entering apartments in Douma late Saturday said they found bodies collapsed on floors, some foaming at the mouth. The opposition’s Syrian Civil Defense rescue organization said the victims appeared to have suffocated. The organization, also known as the White Helmets, and the Syrian American Medical Society, a medical relief organization, did not identify the substance used but said survivors treated at clinics smelled strongly of chlorine. Those reports could not be independently verified because of a government blockade around the town. A Douma-based Syrian opposition activist, Haitham Bakkar, said most of those killed in the attack had been buried. Russia’s Nebenzia said experts from Russia’s military radiological, biological, chemical unit went to Douma after the purported attack and found no chemical substances on the ground, no dead bodies, and no poisoned people in the hospitals. Nebenzia said the bed where a missile purportedly fell wasn’t damaged. “The staged nature of this action is something of which we have no doubt,” he said. Nebenzia urged investigators from the Organization for the Prohibition of Chemical Weapons to fly to Damascus on Tuesday to visit the site, saying Russia and Syria would ensure they get to Douma. Hours after the attack, the Army of Islam rebel group agreed to surrender the town and evacuate its fighters to rebel-held northern Syria, Syrian state media reported. The group also agreed to release its prisoners, a key government demand. More than 100 buses entered Douma Sunday night to take the fighters and their families to Jarablus, which is under the shared control of Turkish troops and allied Syrian forces, Syrian state-affiliated al-Ikhbariya TV said. Syrian state TV said two buses left early Monday and 11 more buses were getting ready to move. Syrian state media said dozens of civilians who had been held for years by the rebels were set free. The evacuations follow a pattern of departures around the capital and other major Syrian cities as the government reasserts its control after seven years of war. In his tweets Sunday, Trump called Assad an “animal” and delivered a rare personal criticism of Putin for supporting him. Trump has declared his intent to withdraw U.S. troops from Syria in the coming months, despite resistance from many of his advisers. More than 500 people, mostly women and children, were brought to medical centers complaining of difficulties breathing, foaming at the mouth and burning sensations in the eyes. Some had bluish skin, a sign of oxygen deprivation, according to a White Helmets statement. The symptoms are consistent with chemical exposure. Douma is part of the eastern Ghouta suburbs, where a 2013 chemical attack killed hundreds of people and was widely blamed on the government. The U.S. threatened military action but later backed down. Syria denies ever using chemical weapons during the war and says it eliminated its chemical arsenal under a 2013 agreement brokered by the U.S. and Russia. Associated Press writers Nataliya Vasilyeva in Moscow, Tia Goldenberg and Josef Federman in Jerusalem, Jonathan Lemire in Washington, Albert Aji in Damascus, Syria, and Edith M. Lederer at the United Nations contributed to this report.